Traveling northeast from Bandung towards the coast, the seaport of Cirebon offers a wealth of culture and history. Situated on the border of West and Central Java, it is home to a combination of both cultures. Gemah Ripah Loh Jinawi means a prosperous city that has many people. Cirebon is actually located at the north coast of Java. It is located at West Java. Cirebon has a great resource of sea, especially shrimps. These shrimps are exported abroad to get so much income for city development and education. This city is almost always be passed every time any one wants to go to West Java or Jakarta from Central Java and any east cities of Java. The location of Cirebon is very strategic. In the Indojavanese time it was the most important harbor of the mighty Galuh kingdom, of which the capital was located in the fertile of Citanduy River, not too far away from Ciamis. The harbor also opened the way to the Cimanuk River, which flows through Sumedang to the lake basin of Bandung. Because the coasts of Western Java are swampy and in some places rocky Cirebon and Sunda Kelapa (Jakarta), together with Banten in the far West, the main entries to the blooming highlands. Cirebon at 14th was a part of Padjajaran Kingdom. The Moslem movement there was so fast and Padjajaran commanded to remove the settlement to Lemahwungkuk, 5 kilometers from Cirebon harbor. In the city itself; the ancient palace (keraton) of Kasepuhan and Kanoman now serve as museums which are open to the public, exhibiting household ornaments, paintings, calligraphy and other art treasures of the courts. The royal carriages are sumptuous in design, one of them a gilded coach in the form of a winged elephant. The three well-known palaces (Kraton) of Cirebon are Pakungwati, Kesepuhan, and Kanoman. The former is the earliest of the three and has said to be occupied by Sunan Gunung Jati himself. In fact, according to the records preserved within the Kesepuhan Palace, and firmly believed by the Cirebon people, the normally accepted account of Sunan Gunung Jati’s life is incorrect. Syarif Hidayatullah was, they claim, the son of an Egyptian King and a Sundanese princess. He lived until the age of 120 and died in 1568 A.D.
Across the square from the Kasepuhan Kraton is “Mesjid Agung” (Grand Mosque), in a traditional Javanese style and made entirely of wood. There is an ancient royal cemetery where a holy sultan was buried which has become a place for pilgrimage at the Astana Gunung. Jati Cirebon is also known for its distinct batik, now a flourishing industry in Trusmi village. The local seafood is among the best in West Java. Another specialty this city can offer the visitor is a wide range of seafood, probably the best in West Java. 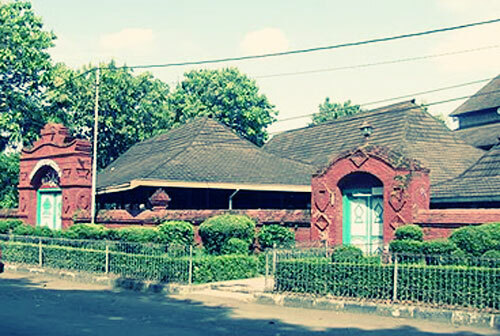 Nowadays Cirebon is on the crossing of a busy coastal road and the main road to Bandung. The harbor, main depot for the oil from the Java Sea, is famous for it’s great catches of fish and other sea animals. Cirebon means ‘River of Shrimps’ and the city has a nickname ‘Kota Udang’, ‘City of the big Shrimps’; historical sources tell us that the name of the city is probably diverted from caruban, which means ‘mixture’ – a witness of the very heterogeneous heir of Cirebon.